When you lie down in the grass and look at the cloud with friends do you feel frustrated that you cannot see the airplane or cow they can see? Or, do you think the sky needs a little more custom decoration? If so you should consider getting a Cloud-O-Matic. The Cloud-O-Matic creates the custom cloud shapes you want to see! Just select the appropriate setting, example [cumulus, airplane, extra-puffy] and your cloud pops out in minutes. 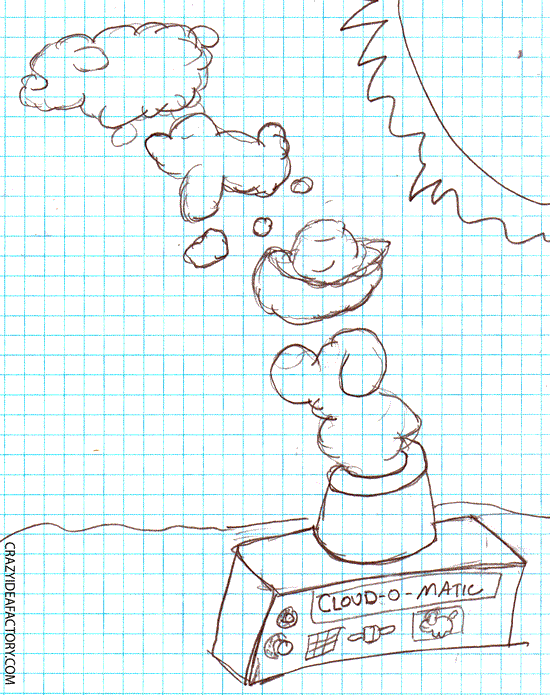 You won’t have to guess if that cloud is an airplane, you will know it is because you have a Cloud-O-Matic making your clouds. Cars are getting pretty great these days. Your car can talk to your phone and mp3 players. You can drive on run-flat tires, and GPS is almost a standard feature. But automakers have not ventured too far from the standard automotive design, meaning my car doesn’t help me get to work any earlier in the morning. I am talking about my car doing things to help me get ready faster in the morning. For starters it should brush my teeth and comb my hair. Then I would like it if my car gave me a back massage and a little pep talk to help start the day out right. 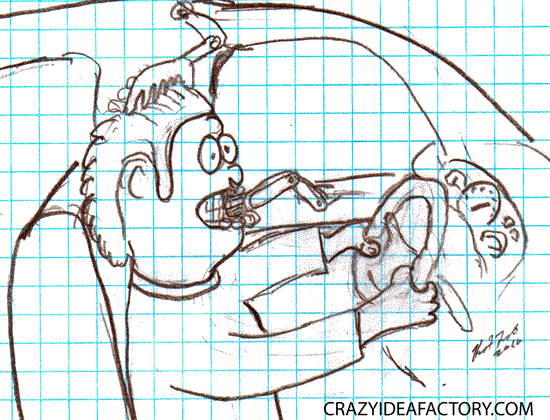 This crazy idea is inspired by the Illustration Friday word of the week, transportation. 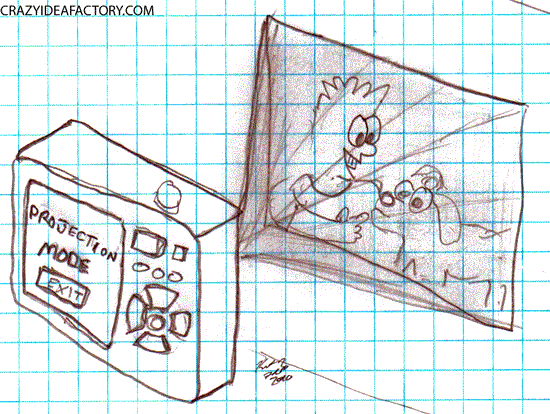 But there is hope, if digital cameras had built in projectors the slide show parties could make a comeback. Except now the picture takers would not be limited to 24 pictures on a roll of film, they can take as many as their camera can handle. A clicking sound could be added just to improve the effect and bring back memories of the old days watching slides from a slide projector. The hassle of taking a frozen entree from your freezer and walking all the way to the microwave to heat it is over my friends! 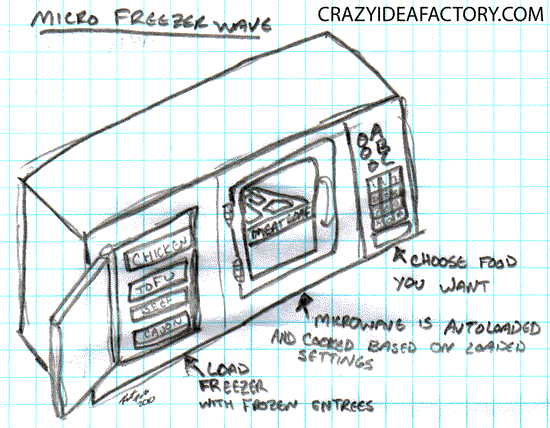 The Microfreezerwave combines the freezer and the microwave to provide the easiest meal you can get in your own home. Load frozen entrees into the freezer compartment rack, when your hungry enter your meal selection into the keypad (don’t worry we will offer an Android/iPhone app so you can do it from your phone without leaving the couch), wait five minutes and you’ll have yourself a meal. Have you ever chosen the squeaky wheel, the one that won’t turn,or one that won’t drive straight? Are you just tired of pushing the heavy thing? Are you like me and can’t find anything in giant superstores? 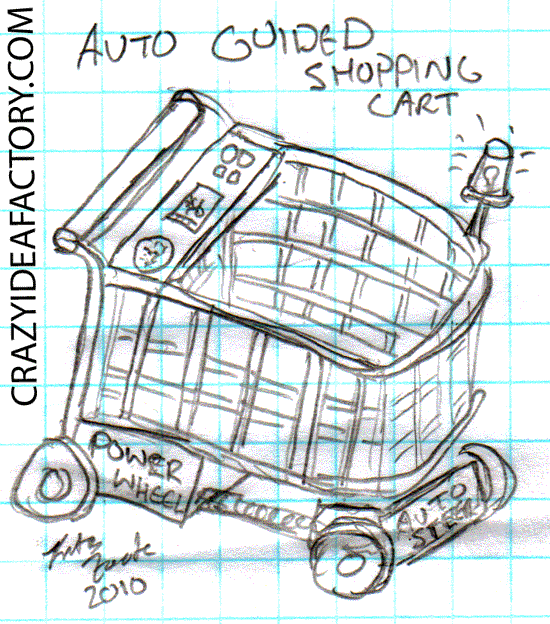 Well, your shopping cart problems are over with the introduction of the automatically guided shopping cart. Just tell the cart what you would like to shop for and it will take you there. For example you could say “I would like to buy some AA batteries” and your cart would lead you directly to the battery aisle. If your a store owner worried about cost, don’t worry you can add up-sell capabilities to the cart. If a customer adds tortilla chips to the cart the cart would mention how well salsa goes with tortilla chips. Next evolution, I feed the cart my list and it goes around and gets everything for me while I go out to eat. For me the hardest part of gardening is pulling the weeds and remembering to water. The idea to solve this problem is The Garden Bot. 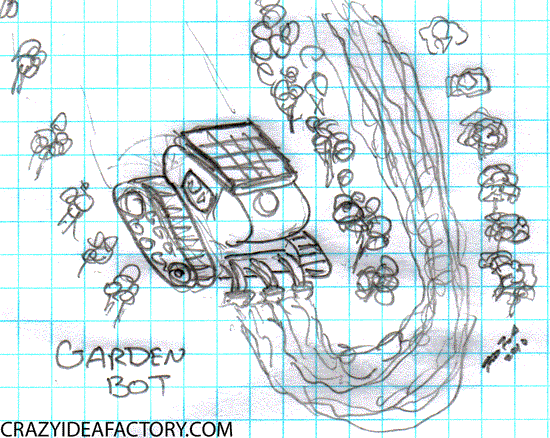 The Garden Bot digs those pesky weeds out of the ground, waters plants as necessary and runs on solar power. Now I just need to find a way to make onions taste better! 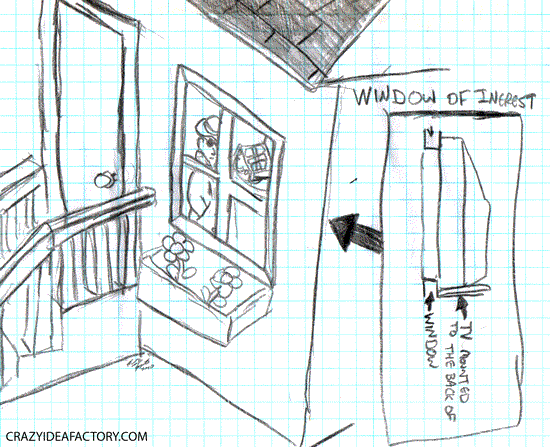 This crazy idea is inspired by the Illustration Friday word of the week, artificial. As the age of real I, Robot draws ever closer I think about the places where I would like to have a robot to help me out in life. That place is of course my pillow. I need a pillow smart enough to understand how I sleep. I shouldn’t have to punch and ball up my pillow to find the exact thickness and softness factors I need to sleep well at night. My pillow should know based upon my mood and level of tension what form it should take while I sleep. If I am having trouble sleeping the pillow should know when to shut the TV off, add some white noise or play some soothing music. 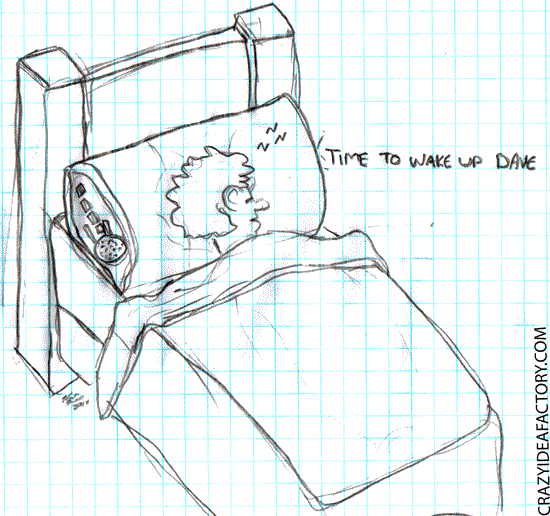 In the mornings if my stinky alarm clock doesn’t wake me up, my pillow should nudge me or push me out of bed. And if needed the artificial intelligent pillow should be able to talk to me at night and offer psychiatric advice. I am sure there is a medical study somewhere keeping track of the amount of injuries incurred by people waking up in the middle of the night and stumbling or walking into something on their way to the bathroom. Imagine if you could wake up in the middle of night, mumble the word “bathroom” or “kitchen” and that word would activate a robot. 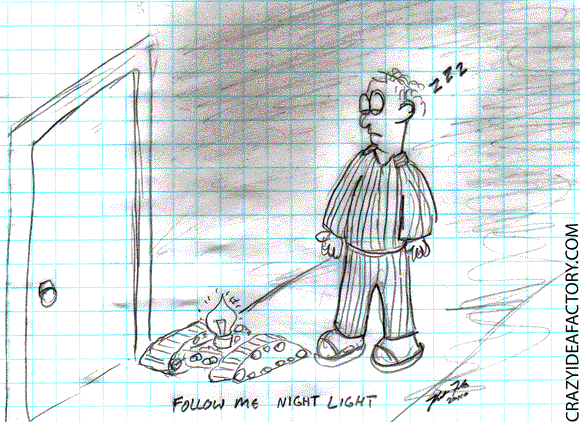 The robot would light up and guide you to your destination and guide you safely back to bed. Better yet the robot could also have a “go get me” mode. You could mumble “go get me a glass of water” and the robot would go out to the kitchen, find a glass of water and bring it back to you. Next development, a diaper changing robot for parents with babies. Maintaining your yard is one of the most time consuming and labor intensive activities you can participate in. All kinds of work and nothing to show for your labor. It is time to make a stand, plant something useful in the yard. Plant corn, tomatoes, rutabagas or whatever your hearts desire. Instead of having a bag of clippings for your work, you can save a trip to the grocery store because you have home grown vegetables from your front yard. 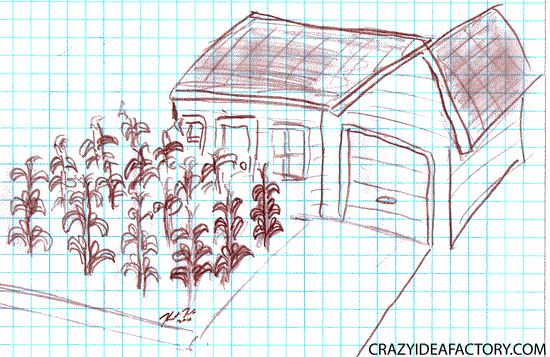 Never mind the looks you get from your neighbors, you won’t be able to see them anyway when the corn gets tall enough.